There have been some football greats who have dabbled in major league baseball (Deion Sanders, Bo Jackson, and Jim Thorpe leap to mind), but who’s the best football player to ever have been identified primarily as a major league baseball player? I’ve given it a bit of thought, and I can’t come up with a whole lot of candidates. (Among those that occurred to me: Jackie Robinson, Rick Leach, Butch Hobson, Steve Garvey; I also considered Drew Henson and Jeff Samardzija, but they don’t quite fit the parameters of the conversation because of their Danny Ainge-like baseball marginality). Maybe it’s difficult to transfer the brute raging aggression of the gridiron to the more ruminative artisanship of the baseball diamond. And a hefty percentage of football players, the pot-bellied, arms-the-size-of-legs behemoths that toil in the grunting sumo clashes at the line of scrimmage, would seem to be excluded from possible baseball careers on the basis of body type alone (the players named above, and the one considered at more length below, all either played in the defensive or offensive backfield or played quarterback, with one exception, Samardzija, who played wide receiver). I don’t know a whole lot about the football careers of Robinson, Leach, Hobson, and Garvey, but none of them seem to have been beyond the high level reached by the player pictured here, who is, if his colorful public persona is any guide, seemingly on the brink of wrapping the pinky and ring fingers of his left hand around the barrel of the bat to leave one finger flying free. 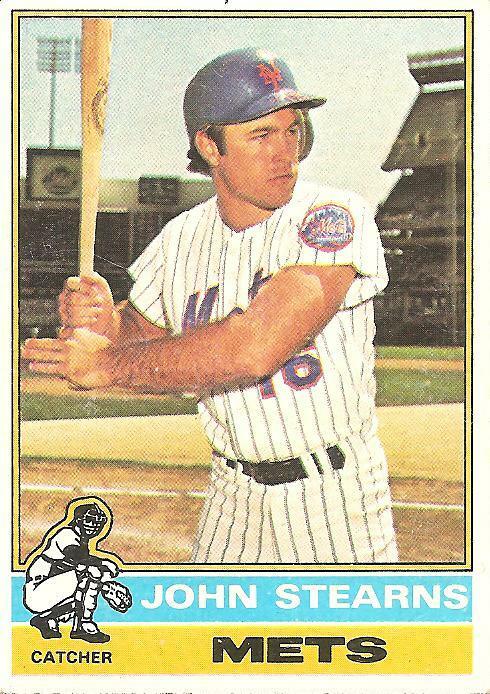 And John Stearns was not only a standout football player at Colorado University, setting school records for interceptions and interception return yardage, but he also gets some points in this discussion for bringing a football mentality onto the baseball field to a greater degree than any of his fellow former football stars. In short, he seemed to really, really enjoy leveling people. On the ever-enjoyable Ultimate Mets memory page, all of Stearns’ “greatest hits” are mentioned: his takedown of a fan who had run onto the field during a game; his body-slam of Bill Gullickson after the enemy pitcher buzzed a fastball at fellow Met Mike Jorgenson’s head; his literally jaw-breaking hit on Dave Parker as the hulking Pirate baserunner tried to separate the plate-blocking Stearns from the baseball; and, most notably, his flattening of Atlanta Braves mascot Chief Noc-A-Homa. As Stearns explained in a 2010 New York Post article, the latter incident included an element of premeditation. I watched him for three or four years and I said, ‘Someday I’m going to clothesline this guy.’ One day I took off, running at him like a defensive back. He looked at me like, “What is this guy going to do?” I didn’t really hit him. I kind of dragged him down. It was just a fun thing but Joe Torre was our manager and he didn’t like it. Another memorable figure from the 1970s who is no longer living within the confines of the name he was known by back then is Levi Walker, Jr., who John Stearns chased down and tackled while the former was in his full mascot regalia as Chief Noc-A-Homa. Walker, a Native American with roots in the Ottawa and Chippewa tribes, was the third and most famous of the men who played Chief Noc-A-Homa, who in addition to running past the enemy dugout before every game (the part of the mascot’s act that inspired Stearns to the most famous of the Colorado Buffalo legend’s many open-field tackles) “lived” in a teepee in the outfield stands during games and emerged to do a dance whenever a Braves player hit a home run. His list of moments in the public eye reads like a back-and-forth between goofiness and politics that somehow epitomizes the 1970s (and the later fallout traceable back to those years). In 1972 his portrayal of a cartoonish Indian stereotype was dismissed witheringly by Native American rights activist Russell Means; in 1974 he brought a lacrosse stick to the park to better his chances of snaring Hank Aaron’s 715th home run; in 1982 the removal of his teepee to open up more ticketed seating area immediately preceded a hideous team-wide slump that finally led the team to reinstate the Chief in his rightful home in time for the team to right itself and win the division; in 1986, perhaps becoming aware of the problematic nature of employing a mascot who was, unlike other notable mascots with googly eyes and giant baseball heads or anteater snouts or chicken feathers, based on a race of humans, the Braves decided to part ways with the Chief, who responded to a question about what he would do next by saying that he had “no reservations” anywhere; in 1991, Walker reappeared as the Braves entered the World Series to debate American Indian groups who were protesting the Braves, whose team name and other appropriations of Indian culture were seen by the protesters as insensitive and dehumanizing. Finally, Walker seems to have eased back into a life away from the spotlight. Below is a clip of him at some kind of festival, making an arrowhead. He seems like a nice guy. At any rate, it’s hard to imagine anyone wanting to tackle him. You are currently browsing the archives for the John Stearns category.